Because of the ride height on mine (and anyone else running a very lowered S2000) you do need to run RCAs and I had to use adjustable camber arms, or you completely run out of camber adjustment. Adjusting suspension / geo settings and using RCAs is nothing new - some good info here. Mark, yes I know. But I always wanted to do these calculations to show this exactly. I am currently doing this becuase my new track width is not easy to compensate, and I wanted to know what I was doing. Remember I am using RCAs too to get the camber gain and inst. centre of rotation compensated with the rear, but the Buddyclub have got adjustable plate that I am currently using it in the other way around (so that it gives less negative camber or more positive camber) in order to reduce the scrub radious. And then I compensate the camber with the shorter effective length top arms, that also gives me better scrub radious and a tiny bit of more camber gain. See below some results and picutres from a model that I believe aproximates to your racing car in the end. The model is for a lowered car only -10-15mm front and rear, with OEM arms and OEM ball joints, etc. (only for the front but I also have the rear). using 9" et63 wheels with 255 tyres all around, and that is why scrub radious (KPI offset distance) is a bit positive. Roll centre heights are actually VERY good indeed with around +15mm front and +35mm rear. The main problem with the OEM set-up is that the inst. centre of rotation is quite far away from the car, and therefore the camber gain is not big. The design of the rear, in the other hand, has got much more camber gain than the front and therefore implies a decompensation on over-under steer when rolling. It needs to be improved IMHO, but, anyway, this is not the point of discussion here. Here are the results of a lowered car -30-35mm in total front and rear with OEM arms and OEM ball joints, etc. Exactly, roll centre goes below ground level (not good at all). Note the new position of the inst. centre of rotation very close to the ground too (not good either). And then the results of using RCAs. All improvements indeed. The angle between arms is greater and therefore, inst. centre of rotation is within the track width now. Therefore more camber gain is added too (see now graph out of range). The roll centre is back to a better position (even though too high probably for a race car with a 4-5 Hz rate. Remember that you want rear roll centre a bit higher than front too). Also bump steer has improved. However, if using these sort of wheels (9" et60), the scrub radious is signficant and it´s worst now with the RCAs (see graphs for Kingping offset above) becuase you have reduced the KPI angle now putting the ball joint a bit lower. Now, if we install the adjustable top arm and move the ball joint inwards around 10-15mm we get better scrub radious and also more negative camber. 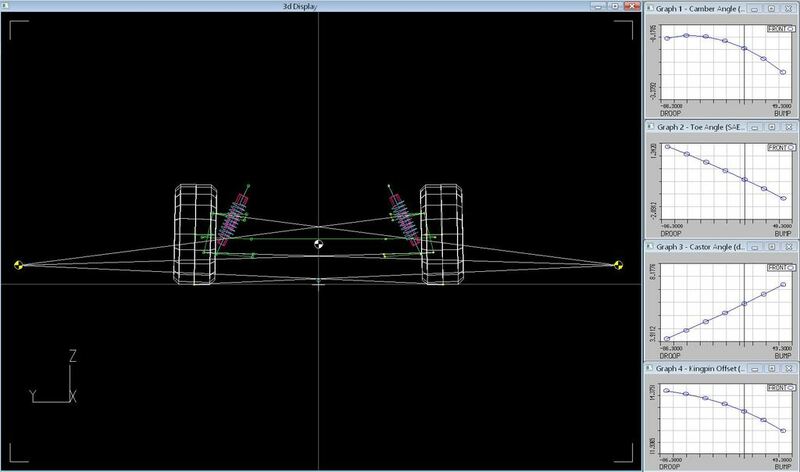 Here the results with the shorter arms: a good set-up with -2.5º camber, still with around 6º caster. I am guessing probably closer to your set-up now? Here the results of placing the bump steer kit of 12mm underneath the rack. It is true that the angle of the rack end (or tie rod end) is smaller now (closer to horizontal) but it does not imply that is better per se. As you can see toe angle (bump steer) is worse. Please note the different of scale (Y axis range - look at values). However, imagine that you could "shaved" the bottom of the steering rack and placing it 6-8mm lower than stock. That will increase the angle of the rack end, but also improves bump steer. Note that new scale is tiny, and as good as you can go regarding bump steer. The main problem, again, is scrub radious IMO. That implies the effect of the bump steer due to the moment created by any lateral forces. My problem with my new track-width: Even more scrub radious (out of the confort zone really). Roll centre as it is with RCAs might be too high for a race car with some ground effect, Mark, specially on the rear as you want the rear roll centre higher there. The best point of using RCAs in my opinion is that you get similar front camber gain than in the rear and therefore avoiding lifting inner rear wheels, etc. I could keep going but I wait for your comments, J.
I think I went about this from a more practical than calculated method, out of necessity. I selected ride heights largely based on corner weighting but also getting the car as low as I could (not slammed!) taking into account a few other factors. I then got a rough geo, and tracked the car to work out what camber I needed, effectively by marking the tyres to get a contact profile. Then aimed for a camber (along with caster and toe to driving preferences) but found I couldn't get it where I wanted without really mucking with the toe. This meant roll centre adjusters to correct the arm geometry but I still couldn't' get the camber I needed so had to go with the adjutable upper arms. I think I was on a minimum of -3deg on the back due to the amount I'd lowered the car, and -3 is too much on the rear with a 255 semi slick imo. I've never really bothered to look at the roll centre measurement after making all the changes though. I know you do. I have been trying to go to see you at the races but never managed to attend. It´d be great to chat definitely. If you could lower the car on the front a bit more, it seems like it will improve even more everthing: bump steer, roll centre height, camber gain, etc. Yes, more than -3º camber is definitely not good, you lose traction in acceleration and braking. Ideally not more than -2.5º or 3º, specially on the rear. It is more important to have more camber gain (with roll) than static camber. Did you get the Nitrons valved under specific requirements? What is the valve rate if you don´t mind posting it? I agree on the front. Unfortunately I have to be careful with ride height regulations (still a bit of room to play with) but there's also issues with practical things like getting it on the ramps on the shuttle, and onto the dyno (its tricky even now) Also the arches would need more work and I couldn't get the ratchet straps over the wheels when towing on the shuttle. Where it is now is sort of optimum for all those situations. I do have a slight rake on the car with the front being lower but I did prefer it with more rake. My dampers were re-worked by Nitron about 2 years ago as I changed spring rates quite a bit, so they re-valved them to match. I have probably got the curves somewhere but not to hand. Have someone measured or know the wheel travel? total travel: compression + rebound? It's called project Binky and the guys doing the build are pretty impressive. BTW I am not responsible for all the time you will not need watching these from the start! What software do you use for the suspension simulation? Does anybody still offer WinGeo? I couldn't find it searching with google.